Attendees in Kigali focused on the roles of data, advocacy, and art in finding solutions to diverse health challenges. Photo by Heather LaGarde for IntraHealth International. 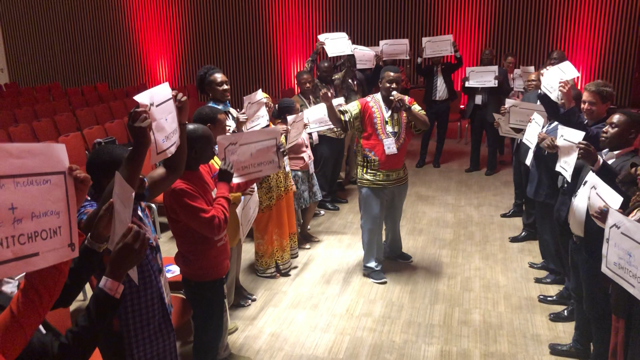 SwitchPoint’s special session this week at the Africa Health Agenda International Conference in Kigali, Rwanda, connected participants to artists, activists, and global health professionals from diverse fields who are expanding the definition of health and working to make universal health coverage a reality. The interactive conference side session, hosted by IntraHealth International, drew on the structure of the annual SwitchPoint conference, introducing attendees first to dynamic presenters before breaking into smaller groups that focused on the roles of data, advocacy, and art in finding solutions to diverse health challenges. Presenters this week included local Rwandan artists, community health workers, and ICT4D (information and communication technology for development) data experts. Toyin Saraki of the Wellbeing Foundation Africa and Githinji Gitahi of AMREF, who presented at this week’s event, will also take the stage at SwitchPoint 2019 next month in North Carolina. IntraHealth’s annual SwitchPoint conference brings together hundreds of leaders from around the world and all circles of humanitarian and global development work to share their breakthroughs, inventions, ideas, and failures. Throughout the year, lead-up events and side sessions at sister conferences, like the one this week in Rwanda, forge unexpected new partnerships among diverse participants, both locally and globally. IntraHealth’s first Africa-based SwitchPoint event last year in Ghana brought together over 200 students, health workers, academics, scientists, technologists, venture capitalists, artists, and others as part of the annual Extreme Affordability Conference. The unusual partnerships and switchpoints that emerged from that event are now transforming West Africa’s health and tech landscape. Some tickets are still available to SwitchPoint 2019! Register here and join us April 25 and 26, in Saxapahaw, North Carolina.